Thursday, London: Bangladeshi protesters from Phulbari were joined by transnational climate activists in a picket of directors of Global Coal Management (GCM) Resources Plc, an AIM-listed British mining company who want to build a massive open cast coal mine by forcibly displacing 130,000 people in Phulbari, Bangladesh. During the company’s annual general meeting (AGM) on Thursday 15 December in London a large group of protesters holding colourful banners and placards with powerful messages occupied the entrance of Aeronautical Society , an elite venue near Hyde Park Corner, where the AGM of GCM Resources was held. Anti-coal protesters outside and inside the AGM called to shut down GCM Resources because the company does not have a valid license for business with Bangladesh but they are selling shares in London and committing abuse and human rights violation of farmers and local businessmen in Phulbari. Protesters outside the AGM chanted “CGM, out out”, “Gary Lye, blood on your hands”, referring to 26 August in 2006, when three people were shot dead and two hundred injured in a demonstration of 80,000 people for opposing plans by the company’s Bangladesh subsidiary, Asia Energy. A delegation of dissidents went inside the AGM and powerfully interrogated the company directors who failed to show evidence of any valid licence for business. The poorly attended AGM, which had only 10 shareholders including the company PR and excluding the six dissident voices, was quickly closed by the Chairman, Michael Tang, who was unable to answer any question from the floor. This year marked the tenth anniversary of Phulbari outburst. The Phulbari project threatens to destroy the homes, lands, and water sources of as many as 220,000 people, and forcibly evict an estimated 130,000 people. If implemented, it would destroy 14,600 hectares of highly cultivable land and would leave devastative impact on the world’s largest mangrove forests and UNESCO heritage site, the Sunderbans. Earlier this year Phulbari Solidarity Group and Bangladesh National Committee called on London Stock Exchange to de-list GCM from London Stock Exchange. The company’s CEO, Gary Lye, has been systematically abusing local opponents of the project. Earlier this year, Lye has filed multiple arbitrary cases against 26 frontline local opponents, farmers, and small business entrepreneurs against mining in Phulbari and Dinajpur. This is incredible, and human rights abuse facing the innocent people and their families who never had anything to do with violence before this company inflicted violence in Phulbari. The Bangladesh government withdrew the mining licence in the wake of GCM’s atrocity but the company continues its dodgy attempts to raise funds for the operation of a perilous project. CGM is selling shares in the name of the Phulbari project in London. Thursday’s picket event was co-organised by Phulbari Solidarity Group and the Committee to Protect Oil, Gas, Mineral Resources, Power and Ports in Bangladesh. Action outside and inside the AGM was joined by transnational activists from Foil Vedanta, London Mining Network, Coal Action Network, UK, Bioregional, Plane Stupid, Reclaim the Power, Socialist Party of England and Wales, Transition by Design, and many Bangladeshi community protesters from Tower Hamlets and East London in the UK. Protesters say that they will not sleep until the company has closed its office in Dhaka and left Bangladesh. Tuesday, the 3rd May, has witnessed the successful blockade of the UK’s largest open cast coal mine in Ffos-y-fran, by several hundred protestors as part of a climate change movement organised by the Reclaim the Power oragnisation to help showcase the damage caused by opencast coal extraction to the environment. This was the outcome of a week-long camping of passionate climate change action organised by the climate action network of Reclaim the Power to highlight issues surrounding the damage caused by mining companies using invasive techniques to harvest the last remaining coal reserves and the impact these procedures can have on the natural environment. The coal company in question, Miller Argent, are looking to significantly increase their coal mining production in this area of South Wales, which would have a devastative effect on the local environment and wildlife. The aim of Tuesday’s action was to undertake a mass civil trespass at the existing Ffos-y-fran opencast mining complex, which began at 5:30am on Tuesday morning and has continued through the day. 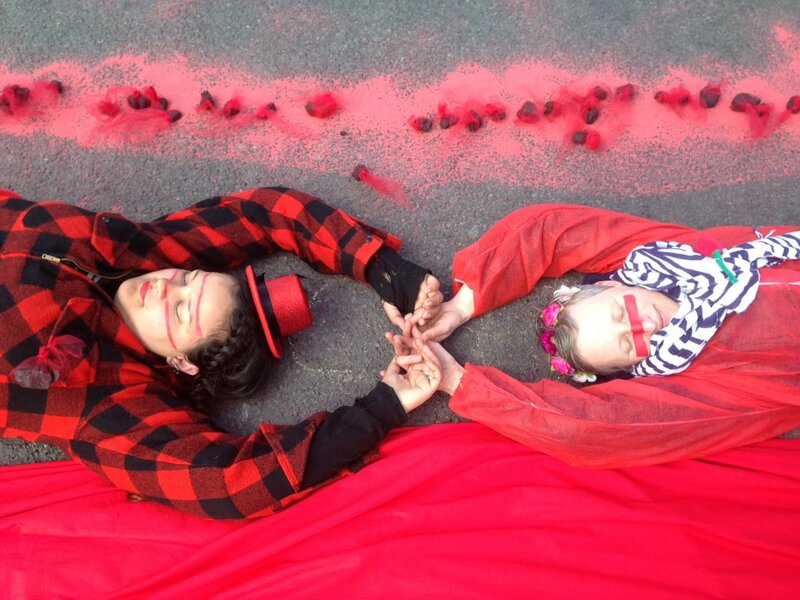 This is how protesters have drawn a red-line on coal mine at Ffyos-y-fran #EndCoal. Copyright: Reclaim the Power. A press release by the Reclaim the Power stated that this is “the largest ever action in a UK opencast mine” with activists traveling from all across Britain and internationally to peacefully occupy the mine and show solidarity and support. Having been fortunate enough to visit the site over the bank holiday weekend, the impact of the existing opencast mine is there for everyone to see and any expansion of this opencast method of coal extraction will have serious implications for the local area. Two huge mountains of waste slag have already been produced as a bye-product of the extraction process. Locals are concerned that the vague promises of this material being returned to the ground once mining is complete will be ignored in the face of the financial benefits of turning the large open-pit mine into a commercial rubbish tip once mining is complete. The Welsh Dragon standing firm in support of the blockade at Ffos-Y-fran and to protect environment. Copyright: Reclaim the Power. Indeed, the decision to look to expand the Ffos-y-fran opencast site seems irrational when you consider that the demand for coal itself is facing a downturn globally, especially with the growth in alternatives to coal within the clean energy sector. Equally, “the Aberthaw power station that uses 95% of the coal mined at Ffos-y-fran announced last week that it is scaling back operations” and many locals are vigorously opposed to expansion of opencast mining in the area hives the devastation that has been caused as a direct result of the mine in the surrounding area. 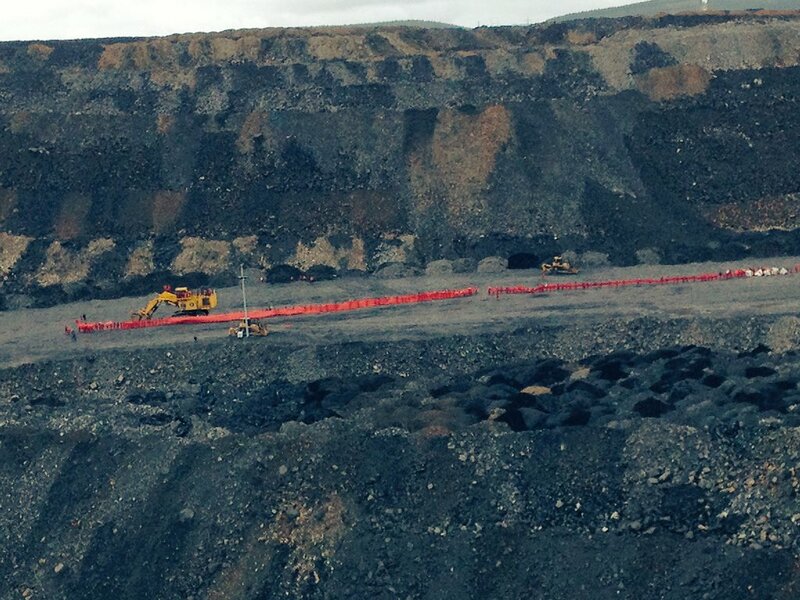 Tuesday’s protest also demonstrated the [assion and climax of Reclaim the Power’s ‘End Coal Now’ climate camp, situated on a hill side adjacent to the opencast mine. Activists from the UK and abroad have braved the wind and the rain to come together and to highlight the importance of fighting to preserve our natural environment and to reduce the impacts of climate change. Events have taken place for five days to help bring together local residents with UK and international climate change activists, unions, Councillors and Assembly candidates to discuss how to guard against the environmental destruction caused as a result of open-pit mining. Solidarity was expressed by many international organisations to Tuesday’s action to end coal in Wales and the UK. Phulbari Solidarity Group has expressed unconditional solidarity with the protesters who blockaded the open-cast mine at Ffos-Y-Fran in Merthyr Tydfil. 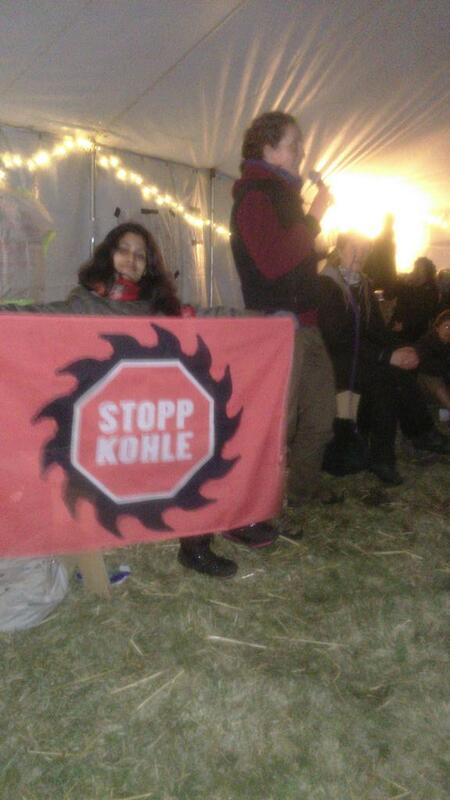 Dr. Rumana Hashem holds a red banner to end coal, presented by an activist from Germany at Ende Gelaende, as a form of expressing solidarity on Solidarity Sunday at the End Coal Now camp in Merthyr Tydfil. Copyright: Paul Dudman. Rumana Hashem, founder of the Phulbari Solidarity Group and executive member of the National Committee to Protect Oil, Gas, Mineral Respurces, Power and Port in Bangladesh, joined the camp and spoke to a full tent of activists on Sunday evening. Rumana shared her decade-long experience in stopping an open-pit coalmine in northwest Bangladesh, highlighting the successful campaign against Global Goal Management (GCM), a London-based mining company, who wants to build an immense open-pit mine in the Phulbari region of Bangladesh. She discussed GCM’s attempts to obtain approval for Phulbari open-pit mine, which if constructed, would result in the forced displacement of 120,000 people and would cause extensive environmental degradation to prime agricultural land in Bangladesh. By illustrating her eye witness to the shooting on a demonstration of 80,000 people that left three people shot dead in spot and over 200 injured in 2006, Rumana emphasised that strong opposition and long-term constructive actions could stop any mining company and government from destroying our planet. In conjunction with speakers discussing the impact of coal extraction on local communities in Germany, the USA and Russia, and the current concerns over the burning of fossil fuels and the impact of carbon emissions on climate change, the Sunday Solidarity panel was organised by the Coal Action Network and Reclaim the Power. The panel went to highlight the importance of environmental activism in order to bring these issues to public attention. There were many more interesting and action-based workshops which took place or four days prior to the action at the End Coal Now camp in Fochriw. Tuesday’s action has been an outstanding success of the organisers who were able to achieve wide media coverage and positive response in mainstream national media including BBC, the Guardian, the Daily Mail and many more who highlighted the action as a successful blockade at the UK’s largest open-cast coal mine. Thanks to the many hundreds of activists who were able to contribute to the climate camp in Ffos-y-fran over the post few days. The public action at the coal face itself is an example of the amount of hard work and effort that many committed environmental activists are prepared to undertake in support of such an important cause. In addition to this, there has been a large amount of hard work undertaken behind the scenes in order to ensure that the “End Coal Now” camp has been a success. From organising free catering over several days, to inviting speakers from across the world and to the practicalities of arranging this type of open event on a large scale, demonstrate the passion, ability and commitment of the climate activists that they would continue to resist and halt the proposed open-cast mine in Nant Llesg. This has certainly been an inspirational event to many and we hope this will act as a spur to all of us to continue the fight to protect our environment. Download the Reclaim the Power Press Statement – HUNDREDS SHUT DOWN UK’S LARGEST OPENCAST COAL MINE. 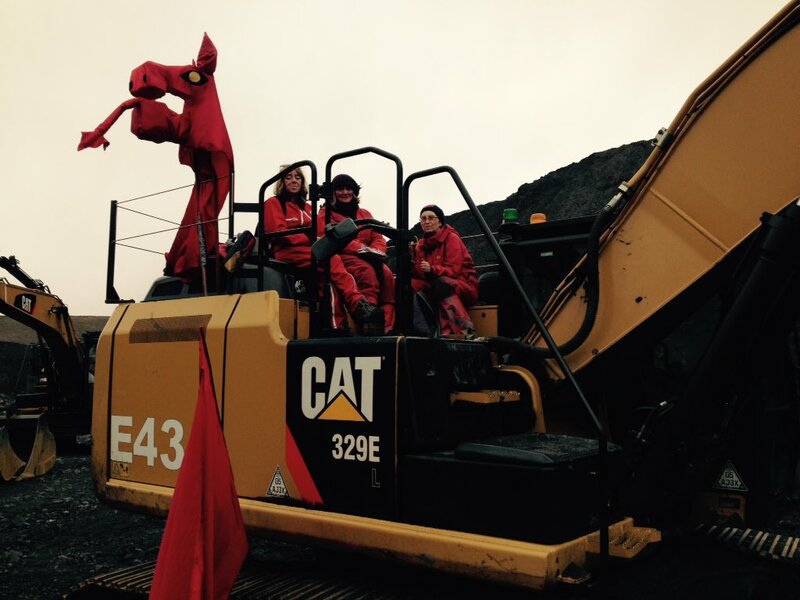 The Guardian – Climate protesters occupy UK’s largest opencast coalmine – in pictures. “Being a close ally of present ruling party, S. Alam group, a Bangladeshi business house, has managed to acquire a permission from the government to set up a 1224 MW capacity coal plant in a populated location in coastal area, Bashkhali, Chittagong. The area is well known for its salt farming along with various fish and agro-cultivation. “S. Alam group signed an agreement with two Chinese companies, SEPCOIII Electric Power and HTG to set up a coal based power plant back in 2013. On 16th February, 2016, the government of Bangladesh approved the deal and set a price to purchase electricity from S. Alam Group at a rate of BDT 6.61 per unit. S. Alam group managed to showcase a total of 600 acres of land for this plant. As much as 75 percent of the investment is reported to be borne by Chinese lenders. “It is important to note that, no environmental impact assessment(EIA) report has been prepared on this plant. In addition, incidents of fraudulence and lack of transparency was visible from the very beginning of the project. Along with 7 thousand households, the propsed landmass for the plant also includes around 70 mosques, grave yards, a technical education institution, around 20 cyclone shelter houses, 1 high school, 8 primary government schools, 2 Alia Madrassa, 5 kaomi Madrassa, 5 markets, and 1 government hospital. Despite of the existence of such intense locality, a total of only 150 households have been reported in the area by the local administration in order to be able to handover the land to S. Alam group.Massive level of illegal practices have also been observed on the dealings of land. A good number of people have been reported to be victimized by the fraudulence of the agents of S.Alam group. “People of Gandamara Union have been protesting against the proposed plant along with range of illegal activities associated with land purchase/acquisition for long. Assaults and threats became common in the process. The local people had tried to negotiate over the choice of location of the plant, appealing to spare the heavily populated areas. On March 23rd, a peaceful protest was organized in the area with the presence of the officials from the administration, in which around 30 thousand people participated. They demanded to spare the heavily populated segments of the area from the already chosen location for the plant. On 2nd April, the local villagers attempted to obstruct the entry of the officials of the S.Alam group into the area, 7 locals were arrested based on the incidenton April 3rd. On April 4th, a protest was organized under the banner of “Boshot vita rokkha Committee” (committee to protect housholds) demanding the release of the arrested ones. Meanwhile, the paid locals of the company called for a counter program in the same location to spoil the event. Following the situation, a restriction was imposed by the local police administration. However, while the angry protestors continued to gather on the spot, around 30 to 40 goons hired by the company began to fire on the unarmed villagers. A large number of people were shot on the spot. At least 4 have been reported to be confirmed dead. “We would like to ask, if the state chooses to call it ‘development’, then where is the Environmental Impact Assessment report? Why is this atrocity? How come there is no space for people’s opinion? Why is the government so afraid of protest? What sort of democracy is this in which the police administration and armed goons are consistently used to assault the people in protest? We have seen it in phulbari. Now witnessing the same in Rampal coal project near Sundarban, Ruppur nuclear power plant and in Moheshkhali in Cox’s bazar. “As long as assault, land grabbing, evicting people, and threat continue in the name of development, discontent would prevail. If the interest and consent of people are not prioritized, people will reject every so called development project.